Since our last newsletter in June, 2016, many exciting developments have taken place. We now have two new Regional Action Centers, one in Skopje and one in Warsaw, and are developing plans to establish many more RACs. Keep reading to go over the most important events, updates, and developments for the IYGU! Since our last newsletter, we have established two new exciting RACs. Dr Biljana Apostolovska Toshevska will run the RAC for Macedonia in Skopje, which will be hosted by the Macedonian Geographical Society. The Polish RAC will be hosted by Collegium Civitias, in Warsaw, and run by Dr. Katarzyna Iwińska. Plans to establish RACs in Praia (Cape Verde), Tundavala (Angola), Bamako, Tbilisi, Worcester, Lausanne, Quito, Lima, Havana, San Jose, Bogota, Hong Kong, Dublin, Malmö, Muscat, and Seoul, to name but a few, are underway. Click here to get an overview of the active RACs and contact details, here for an upcoming events calendar, andhere to see a world map showing activities in your area. Clickhere to meet the people behind the RACs and hear more about their institutions and projects. Three of the six IYGU Open Access Springer books Eating, Drinking, Surviving (Peter Jackson, Farhana Sultana and Walter Spiess) Working, Housing: Urbanizing (Allen Scott, Peter Taylor and Jennifer Robinson) and Communicating, Networking, Interacting (Margaret Robertson),will be available online shortly. The books were presented during the 33rd International Geographical Congress in Beijing in August. The Department of Geography, Faculty of Arts, at the University of Ljubljana dedicated the 2015-16 summer semester to the IYGU, looking at how individuals are involved on the local level. Geography students were asked to document good practice examples from various regions and fields, and to capture them in words and pictures, in order to present them to Slovenian as well as an international audience. Please click here for some of the wonderful examples that they have recorded. On September 22 the Brazilian Chamber of Industry (CNI) will host an IYGU Opening Ceremony for Brazil in Rio de Janeiro, which will be opened by José Serra (Minister of Foreign Affairs), José Sarney Filho (Minister of the Environment), Robson Braga de Andrade (President of the National Confederation of Industry), and Eliezer Batista (Ex-minister of the Mines and Energy Ministry and Strategic Affairs). The first panel ‘How socio-environmental values influence production and consumption patterns’ includes the following participants: Klaus Toepfer (IYGU Patron), Gordon McBean (IYGU Steering Committee), Walter Dissinger (President of Votorantim Ciment), Ulisses Sabará (President of Beraca, Brazil), Isabella Wanderley (Vice President of New Channel Development at Grupo Boticário, Brazil), Marcos Troyjo (Director of BRICLab at Columbia University, Brazil), and Benno Werlen (IYGU Executive Director); the panel is facilitated by journalist Rosana Jatobá. The second panel "The market's role in the valuation of forests and biodiversity", is also facilitated by journalist Rosana Jatobá; the panellists are Kim Carstensen (Denmark) and Rik Kutsch Lojenga (the Netherlands). Debaters are: Amy Fraenkel (Canada), Elizabeth Carvalhaes (Brazil), Pedro Luiz Fernandes (Brazil), and Rui Pedro Ribeiro (Brazil). For additional information click here. Anantha Duraiappah, from the UNESCO Mahatma Gandhi Institute of Education for Peace and Sustainable Development (MGIEP) and the IYGU Steering Committee, is developing an exciting new project titled 'Sustainable Development, Global Citizenship, Peace for Excellence in Leadership' (SCOPExL), with the IYGU and many of our partners. The program's goal is to develop the competencies and capabilities of future global leaders to shape peaceful and sustainable societies, through transformative learning across knowledge, sectoral and geographic boundaries. The first meeting will take place in Paris, at Sciences Po on the 4-5 October. The Portuguese National Commission for UNESCO (ASPnet of UNEESCO schools), in collaboration with CIPSH and theIYGU Iberian Regional Action Centre, is celebrating the IYGU by organizing the 8th edition of Portuguese ASPnet Schools contest, which will be launched among the secondary schools next October in Portugal. To find out more, please contact yournational UNESCO commission or the CIPSH secretariat. 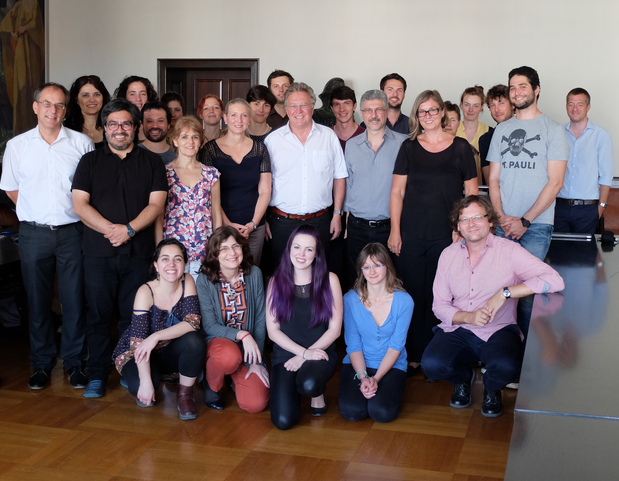 The IYGU and DAAD Summer-School “Political Ecology and the Spatial Turn. From ‘Living Spaces’ to Global Understanding” is currently being held at the Friedrich Schiller University, Germany, in collaboration with the University of Buenos Aires, theUniversity of Chile at Santiago de Chile and the RACs for Argentina and Chile. Students from Germany, Argentina, and Chile will attend lectures, workshops, and field trips from the 1-10 September. The DAADPatagonia Networkis one of the IYGU's newest partners. The Patagonia Network works with transnational change, using the example of Patagonia. With eight participating universities, the Thematic Network deals with social inequality, intercultural exchange, and aesthetic expressions.Partners include Universidad de Buenos Aires, Universidad Nacional del Comahue, and Universidad Nacional de la Patagonia San Juan Bosco, Argentina, and Universidad de Chile, Universidad Austral de Chile, Universidad de Concepción, and Universidad Católica de Temuco, Chile and theFriedrich Schiller University, Germany. Apheleia, a strategic partnership, aims at structuring a convergent set of tools that will foster the need for a properly Integrated (as opposed to dispersed) Cultural (i.e. human and diverse) Landscape Management (rooted in human understandings and leading towards governance through awareness and critical thinking) for Local and Global Sustainability (addressing the great global dilemmas, but also focused on individual anxieties and needs).Click here to view the participating partners. One of the IYGU’s proclaiming international councils, theInternational Council for Philosophy and Human Sciences (CIPSH), is currently working on helping to establish a series of UNESCO Humanities chairs, leading up to the World Conference of the Humanities, in 2017, including, among others, proposals for chairs in Humanities and Integrated Cultural Landscape Management (to be established at IPT, in Mação-Tomar, based in the Apheleia network) and Global Understanding for Global Sustainability (to be established at the University of Jena, also with Leipzig and Erfurt, based in the IYGU network, supported by the IGU). CIPSH is also in the process to accept the Asian New Humanities Net (ANHN) as a new regional member. Established in 2004, the ANHN works their regional network in Asia to share humanities resources, having a major contribution in the ongoing global renewal of the Humanities. Another local co-operation has been formed with JENA-GEOS®-Ingenieurbüro GmbH that engages in complex geo-scientific research and consulting in Germany and abroad. Prof. Benno Werlen also addressed attendees at a conference organized by JENA-GEOS®. Partnership with the Taihu World Cultural Forum (Macao) has been established. Chao Gejin, Luiz Ooosterbeek, and Benno Werlen have been appointed Members of Council of World Cultural Forum (Taihu, China), enabling a long-term partnership with the IYGU network. Collaboration with Future Earth based on the IYGU Arts related activities (in cooperation with CIPSH, the global Action Center for Arts in Paris and the Glastonbury Festival) IYGU has been invited by Paul Shrivastava, Future Earth Executive Director, to participate in a discussion to launch a major project that was originally focused on “arts and science” and evolved into a transversal humanities, sciences and arts project, with the tentative title “Sea Change: Catalytic Conversion of Water Culture and Infrastructure”. The project will be presented to major research funding agencies. Rio de Janeiro, Brazil September 6-10: Our RAC in Brazil will be holding an event together with the Brazilian Academy of Philosophy, and with institutional support from Firjan and ITM and lots of volunteers’ hard work. The Vice president of Anprotec, engineer and Professor José Alberto Aranha, will participate as a speaker in this event. Kyoto, Japan 10 - 24 September The 55th Map and Geography Exhibition will be held in Kyoto Japan. Québec, Canada September 21-23: Colloque "Baie-Saint-Paul: inspirer le monde" (organized by the Ville de Baie-Saint-Paul, in colla-boration with thedépartement de géographie at l’Université Laval and the CIRODD). Nuremberg-Erlangen, Germany October 24: The geography department at the University will be hosting lectures that focus on Global Understanding during the winter semester 2016/17, with a presentation by Prof. Benno Werlen on October 24. Switzerland September - January: The Geographischen Gesellschaft Bern will be holding a nine part lecture series in Bern, Zurich, and St Gallen, titled 'Global Understanding – Wir leben in EINER Welt' during their winters semester. Click here for the program and information click here. Tell Your Story Competition with IYGU, ESRI, and EUROGEO! for school pupils to tell their Global Understanding story. For each group, 1st, 2nd, and 3rd place prizes will be awarded. The City Montessori School in Lucknow, India is holding their 11th International Innovation Day, with the themes IYGU and International Year of Pulses. Students can participate in many contests, ranging from essay writing to slogan writing competitions, to a 're-purpose it' contest. Students from India and neighboring countries, between the ages of 9 and 18, are invited to participate. The upcomingIGU International Geography Olympiad (iGeo) will be held in Belgrade, Serbia, in 2017. Talks are underway between the IGU Taskforce and iGeo planners, and the IYGU to establish the IYGU as the theme. The iGeo allows geography students from across the world, between the ages of 16 and 19, to compete in a series of geography tests over four to five days. Clickhere to look at past iGeos and their questions, and here to view the latest in China, which had participants from 45 countries. At the33rd International Geographical Congress, in Beijing, P. R. China on August 21-25, 2016, the IYGU was presented Tuesday August, 23rd, between 16:30-18:00 in room 311A, where participants were able to listen to a session chaired by Benno Werlen, with a range of presentations made by Hidenori Okahashi, Yukio Himiyama, R. B. Singh, Joop van der Schee, and Margaret Robertson. Benno Werlen also gave a keynote presentation during the final Plenary Session on August 25th. Additionally an IYGU booth was available for all interested parties to visit, which was done in cooperation with the Chinese Geographical Society. During the closing ceremony Carl Folke was awarded theIGU Planet and Humanity Award, in recognition for his "outstanding contribution to science and action on the resilience of humanity and the planet". The Planet and Humanity Award was created to honour individuals (not necessarily geographers) who have made outstanding contributions to environmental issues. Click here for more information. Following this Benno Werlen was awarded the prestigious IGU Laureat d'honneur. The Social Geographer from Jena was honoured for his life’s work. The IGU's Laureat d'honneur, established in 1976, recognizes "individuals who have achieved particular distinction or who have rendered outstanding service in the work of the IGU or in international geography and environmental research" Click here for the German press release. Click on the following links to read about new IYGU publications. Arte e Simboli Celtici. Il legno racconta la storia di un popolo. By Adrea Fiorina. With a forword from Luiz Oosterbeek. Eating, Drinking, Surviving by Peter Jackson, Farhana Sultana and Walter Spiess. Working, Housing: Uranbizing by Allen Scott, Peter Taylor and Jennifer Robinson. Communicating, Networking, Interacting by Margaret Robertson. Copyright © 2016 International Year of Global Understanding, All rights reserved.